The brainchild behind Winner in You is its Founder, CEO and Chief Facilitator, Shamim Rafeek. 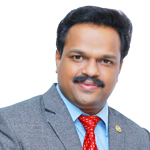 Your search for the Best Corporate Trainer in Kerala / India will end once you meet Shamim Rafeek. An International Corporate Trainer. Business Coach. Author. Motivational Speaker. Shamim has many achievements to his credit gained over a period of 20 years of experience in Leadership Development, Sales & Marketing, Business Coaching and Corporate Training. Shamim is a Certified Coach who has a successful track record in coaching more than 300 Entrepreneurs across the globe. He broke new ground in experiential training & coaching with Winner in You Training & Coaching Services, his brain child. His flagship programs – ‘Lead to Win’, ‘Sell to Win’, ‘Spirit to Win’, 'Present to Win', 'Wow Your Customers' and ‘Seeds to Win’ – have transformed the lives of 1,60,000 plus participants the world over. His core area is in helping each individual to increase their output, achieve personal goals and thereby ensure organizational growth. He has addressed more than 1000 forums as the Key Note Speaker and undoubtedly he is one of the Best Keynote Speakers in India. In fact, simply reading his book on management, “Success through Excellence”, launched by the Academy Award winner Padmasree Resul Pookutty, is enough to sow the seeds of success in the minds of the reader. Indian Society for Training & Development (ISTD) honoured Shamim Rafeek with the coveted award- “Best Trainer of the Year”. 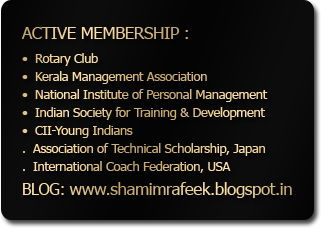 With 300 plus brands in his client list, Shamim Rafeek is rated as one of the Best Corporate Trainer in Kerala / India. Over the years, Shamim has coached and trained Executives, Managers, CEOs, Entrepreneurs and Professionals. He is a much sort after Motivational Speaker and has addressed several conferences in India and abroad.